Ask executives at the money center banks how they plan to win, against both fintechs and smaller institutions like credit unions, and they smirk as they say two words, big data. Big data is today’s magic. How does Amazon knows what book you want to read next, or what music you want to buy, or when you are about to run out of cat treats? Those are simple examples but the answer is big data. Amazon crunches a lot of data, in a blink of an eye, and it knows what you want, maybe before you know. The race now is on inside financial institutions to crunch lots of data and to achieve similar predictive intimacy about their customers and members. Think about how many pointless marketing pitches go out: mortgage info to a member who just bought a house, car loan info to a member who just leased a new BMW, and credit card info to a member with a 500 FICO score. Big data means never making a dumb pitch again. 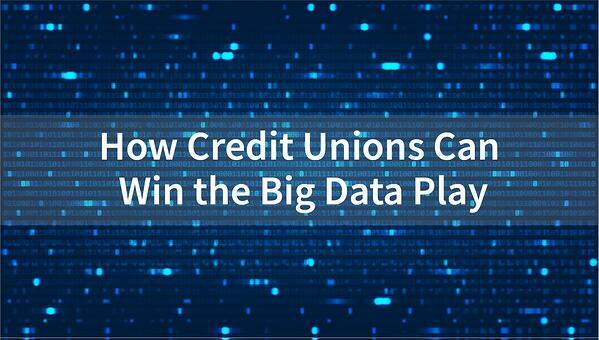 The right big data also means knowing which members are on the verge of leaving the credit union - and may even provide clues on how to keep them, perhaps even to get them more engaged. Big banks think they have enough data to begin to make very smart, very targeted guesses about their customers. They believe they will keep more of them, keep more happy, and increase engagement. All by mining big data. Probably they are right. And probably too community banks don’t have the scale of data and neither do just about all fintechs. So the big banks already are in their victory dances. But they don’t get one important thing: credit unions have a possible big data play that will even the field against the biggest banks. Just maybe even let credit unions win. Often. OnApproach, the Minnesota-based CUSO, is spearheading an effort - it calls it Caspian - that will give credit unions a so-called data lake that rivals that of the biggest banks. And the Caspian Sea, by the way, has the largest surface area of any lake in the world, some 143,200 sq. miles. So the OnApproach choice of name makes perfect sense. Add up the assets of all US credit unions and the total about equals the assets of Citibank and many times more than US Bank. And it also is serious data and, through Caspian, the OnApproach plan is to create a data lake that lets participating credit unions collaborate to play competitively against even the biggest banks. “Credit unions can do this, collaboration is in their nature,” said Austin Wentzlaff, an OnApproach Vice President. But what about the big data plays attempted by a number of credit unions in the past half dozen years, many of which never produced much good? “Credit unions are not big enough to really do big data,” said Paul Ablack, OnApproach CEO. He said maybe Navy Federal has the scale but others, not really. But credit unions have a path to victory. Ablack pointed to the credit union shared ATM network - bigger than any bank’s - and also its shared branching - bigger than all but Wells Fargo - and said that if credit unions pool their data together in the Caspian data lake, they will have information that will prepare them to compete with the biggest financial institutions. Ablack envisions a lake populated with all the information a credit union has - and even some acquired from outside sources (such as building permit data, insurance policy data, real estate price info from Zillow, maybe auto data from an Edmund’s, etc.). Wentzlaff added that OnApproach already has tools to pull in data from five highly popular core systems and, he said, the company does not anticipate significant issues in putting core data into Caspian. The list can go on because just about all data is useful in a data lake and - crucially - OnApproach has developed tools that will normalize and scrub data and make it useful in the lake. Know this: some earlier credit union data plays failed simply because the data was not rich enough. Ablack envisions Caspian as a data rich lake, filled with both structured data (the kind pulled from cores, Oracle databases, etc.) and unstructured data (email, video, images, data scraped from social networks, etc.). Remember that. Hear about a big data play and always ask: how rich will the data be? Is there a lot of unstructured data? Meager data - limited data pulled from just a single source - really won’t give the insights that are needed. That’s why the Caspian data mix is crucial. And when many credit unions participate, the lake gets richer and more valuable as a kind of network effect plays out. How many credit unions does OnApproach need in Caspian to make the lake rich enough? Wentzlaff said that just adding one credit union to another will increase the value of the data but he elaborated that with maybe 20 to 30 credit unions participating, all will be big winners but increase that to 2,400 credit unions and we have a game changer. Ablack stressed that the Caspian architecture is built to be scalable. As more credit unions seek to join, the welcome sign will stay up and lighted. Ablack also envisioned welcoming fintechs with specific data mining tools to offer their data analytics to credit unions in Caspian. The right tools will help credit unions make more sales. But use of the third party tools will be at the discretion of the individual credit union. What if a credit union tries Caspian, then wants out? Their data remains their data and there will be a mechanism for a frictionless exit. When can a credit union dive into the Caspian lake? Right now Caspian is in a proof of concept pilot involving four credit unions. Ablack said he anticipated that Caspian will be thrown open to more credit unions in Q4 of this year. Credit unions that want to win the war against big banks and community banks need to mark their calendar.